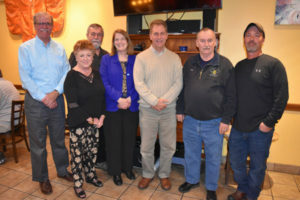 Catoctin Colorfest, Inc. held its annual banquet in November at Simply Asia in Thurmont. This yearly meeting serves as a wrap-up for the Colorfest annual festival. The weather for the festival was not optimum this year, with cold temperatures on Sunday, some rain, and plenty of mud. Crowds still turned out in large numbers to enjoy the offerings from hundreds of vendors. The festival was also able to avoid the power outages that plagued last year’s event. The Town of Thurmont issued 798 vendor permits for the event this year, of which 244 were for the Colorfest, Inc. vendors in Community Park. Among the other stats Catoctin Colorfest, Inc. listed were: 5,120 pounds of trash were generated in Community Park during the event; 72 bales of straw were delivered to combat the mud; and 9,600 apple dumplings were sold by the Thurmont Ambulance Company. The 56th Annual Catoctin Colorfest will be held on October 12 and 13, 2019.